CFHI wants to help you share your one of a kind moments from your program! We are excited to be starting a ‘Photo of the Week’ contest where we will select a winning photo every Friday of the week. Entering your photo is simple, just tag us on Facebook and or Instagram @CFHIglobalhealth and use our hashtag #LetTheWorldChangeYou. Just take a quick look at our Social Media Ethics and our Photo Contest guidelines. ATTENTION ALL ALUMNI: We also want you to share your past experiences with us, you are encouraged to post any past photos! Just use the hashtag #LetTheWorldChangeYou, #TBT, and tag us @CFHIglobalhealth, your photo could be featured in a Throwback Thursday post! How long does the POTW contest last? The Photo of the Week contest is a summer event that CFHI is running for 8 weeks over July and August of 2016. Individuals can tag their photos they take/took while partaking in one of CFHI’s 30+ programs. Every Friday starting July 1 – August 26, we will announce a ‘Photo of the Week’, or a photo we felt best represented CFHI’s motto of ‘Let The World Change You’! 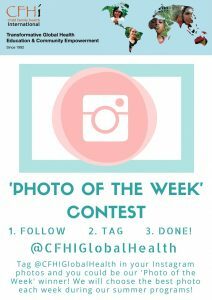 This is an online social media contest therefore you are automatically entered by posting a photo and tagging us in it instagram @CFHIglobalheath or by tagging ‘Child Family Health International’ on Facebook. You should also use the hashtag #LetTheWorldChangeYou! We will choose the POTW winner based on Instagram and Facebook posts. However, you are free to post on any social media site (Twitter, LinkedIn, etc. ), just remember to tag us! What are you looking for in a winning photo? We want to show what it is like to be a participant in CFHI’s worldwide programs! We are looking for photos that best represent you and your program, the work you are doing, and the experience you are having. We know that there will be many interpretations of this and we are so excited to see what you come up with! With over hundreds in our summer programs and 8,000+ alumni, we want to be as fair as possible and see different people from different programs each week! However, it is possible to win more than once, just not in a row. So share as many photos as you would like! What if I want to share old pictures? We absolutely want to see and feature alumni photos too! 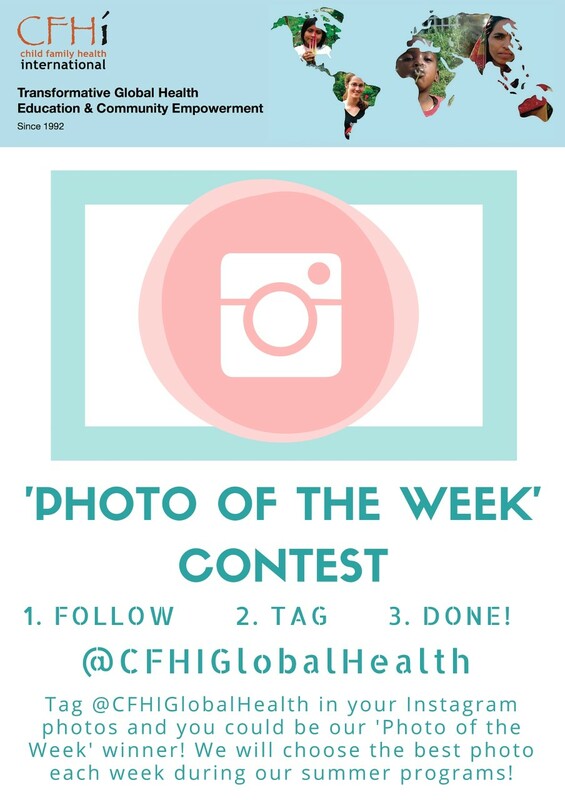 Just post on instagram, tag us in the photo (@CFHIglobalheath), and use the hashtags #LetTheWorldChangeYou and #TBT so we can select your photo for a throwback Thursday special mention! Gloating rights and a sweet congratulations card from CFHI, what more could you want! 😉 All winning photos will be used throughout our social media channels and maybe even in our future promotional material, you famous photographer, you! Where will you feature my photo? We will feature your photo on Instagram, Facebook, and might use it for other promotional purposes throughout the year. Each time we do, we will tag you or make sure to credit you and your great photographic skills! This entry was posted in Promotional Works on July 7, 2016 by Keaton Andreas.